Just as an artist brings a canvas alive with his bold use of colors and hues, so too does Harvey Bower bring blocks of wood alive, transforming them into decorative forms and shapes with skilled turns of a lathe. Bower is a professional woodturner living in the historic gold rush town of Jacksonville, Oregon, nestled in a fertile valley beneath the Siskiyou Mountains. He works in a small converted garage that was once a dentist’s office. He coaxes beauty out of wood and often presents the townsfolk with his creations–from burial urns to spindles for stair railings to commemorative gavels. He’s a giving man who uses his skill to help restore the town’s antique homes, provide elegant objects for the town’s fund-raising auctions, and donates ornamental vessels to college galleries. The magic begins in Bower’s shop, a model of efficiency and functionality. Every bit of space is used. Tools adorn the walls. Wood chunks, finishing supplies, waxes, and oils fill the cabinets. A lathe and other pieces of equipment occupy the floor. Even the rafters hold stacks of wood. “Think of a single car garage, something that would fit a Model T. Then cut the length in half. That’s the size of my woodturning shop. The other half is used for storing wood,” Bower says. “When you’re turning, you’re forever changing tools. You may have 10 seconds on this one before you switch to another that works better. I’m constantly switching tools back and forth all the time. If a tool is too far away and you don’t grab it, then you start to make do. And that’s not good,” he explains. Bower’s creations grow out of his fascination for wood–the way it feels, the sweet aroma after it’s freshly cut, the warmth and wild beauty of its colors. Although he once worked as a wood carver, he switched to woodturning as he found the turning process immediate and richly satisfying. Bower will be the first to tell you that to be successful at woodturning you must first possess a passion and deep appreciation for wood. That’s paramount. Next, you must master basic woodturning skills. That comes with practice and patience. And finally, you must have the proper tools. “Nothing beats a good tool,” he declares. So Bower buys custom tools made from the highest grade steel. Most come from England–companies like Crown, Hamlet, and Robert Sorby. Others he buys from Thompson Lathe Tools in the United States. “I’m an old metallurgist. When I see a diamond checker on the end of the tool to see what the hardness is, I know it’s a quality tool. If you want something that’s going to do the best job, it has to be the right steel,” he asserts. All these tools come in a wide variety of sizes and shapes, so a beginner can buy more tools as the skill and need increass. Another tool that should be included, but later, is the skew chisel. It’s the most difficult tool to learn to use and sharpen, but one that has many virtues once mastered. All of these tools are used with a lathe. Because of his shop size, Bower uses a mini-lathe with an 18-inch bed instead of a larger lathe with a longer run. The mini-lathe, ideal for creating smaller objects, turns a spindle up to 18-inches long and 12-inches in diameter. Although he uses a smaller lathe, he insists that it come with the most powerful motor one can get for that size. He also highly recommends having a speed control. It eliminates the need to change the belt to a different pulley size every time a change in speed is needed. “To change the speed on an inexpensive lathe you have to move the belt to the proper pulley size in order to get just one speed setting. So an electronic speed control, which gives you an almost endless choice of speeds without the hassle, is pretty important,” he says. “It must also be able to turn in both directions. This allows me to cut in one direction and sand in another. You want to sand the wood in the opposite direction because you don’t want debris spraying into your face. You want it going into a vacuum system, which is a lot safer,” Bower notes. 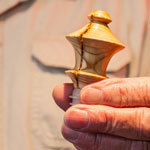 Although he owns a drill press, he says 90 percent of his drilling is done with the lathe. A woodturner also needs a band saw, a small Gentleman’s saw to do final cutoff, and a chainsaw for cutting logs and larger pieces of wood. Because measurement is critical in woodturning, Bower uses micrometers and calipers. For example, if he wants a lid to fit perfectly on a wooden vessel, he’ll use a micrometer. Micrometers are used for measuring diameters, while calipers measure inside and outside diameters as well as depth. Bower sharpens his tools every five minutes or so to keep them from grabbing or gouging the wood being turned. “If the wood is turning about 2000 rpm, that’s like sticking your foot out a car door while going down the road at 60 mph. Think of the abrasive action; it doesn’t take long for the tool to get dull,” he says. For sharpening, he uses an 8-inch slow speed bench grinder with sharpening jigs that enable him to get the correct angle on each tool. “Because the jigs are very precise, I don’t have to guess about the angle. I can sharpen my tools at the same angle every time,” he adds. A moisture meter is another essential tool Bower keeps handy. “You really need to use a moisture meter,” he says. “Some of the wood I use is very expensive–anywhere from $100 for a small piece and up. I have one piece that’s $900. When you spend that kind of money on wood, you don’t want to turn it with the wrong moisture content in it. It can crack or shrink. That’s why I use a moisture meter–to prevent that from happening,” he confides. “When I cut a top to fit perfectly on a vessel, if I don’t check the moisture content, either it won’t fit next week or it will bind up so tight that it will never work. Or, if I use poplar wood for staircase spindles, it has to be checked for moisture because it’s a soft wood and contains more moisture than a hardwood. It also has to stabilize in your environment. You can’t store it somewhere else and then bring it in and think you’re going to work on it because it will swell or crack. That’s why it’s critical to check for moisture,” he says. Bower works with many different woods, including black cherry, maple, figured maple, any fruit wood, pecan wood, tulipwood from Brazil, and jet black ebony from Africa. Each species has a different moisture content (MC) level, so a woodturner needs to know the MC of each species being used. For example, maple is going to have different MC levels than hard oak or ash. 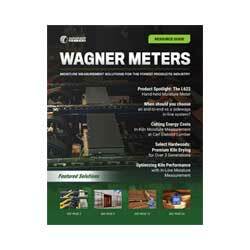 He appreciates Wagner Meters because the company produces a variety of moisture meters for wood for every situation. 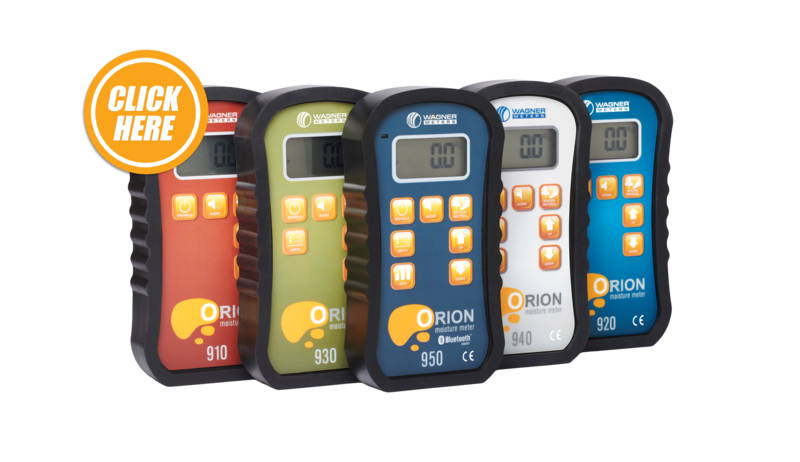 The Orion® moisture meter line from Wagner Meters measures the MC for common hardwoods, softwoods, and exotic species. With its programmable fast selection species settings range, each wood species can successfully be measured for its MC. Another thing he likes about the Wagner meters is that they are pinless, meaning they don’t put unsightly holes in the wood surface. “If you’re testing a board that you just finished planing, you don’t want to stick pins into it. You want a pinless meter. They’re probably the best meters for any operation because they cover the spectrum,” Bower says. “If you invest the time, effort, and money into your work, it’s just good economics to use a moisture meter,” he adds. 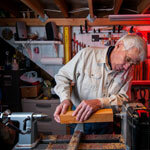 Safety and comfort are other important factors when operating a woodturning shop. Bower takes both seriously. Among the things he’s done to be safe and comfortable is install ample lighting, including a high-intensity LED light. “When I throw the lights on, it looks like the landing craft of ET’s spaceship. But you need to see what you’re doing to prevent costly mistakes and prevent accidents,” he remarks. Since his shop is on concrete, he installed a thick wood platform using industrial plywood to avoid standing on the hard concrete floor and to prevent slipping. It also gives him a height advantage relative to the lathe. In the winter, he uses a large parabolic electric heater and has infrared heat lamps installed on the ceiling directly above the lathe. The infrared lamps help keep his hands warm and flexible. To manage the dust, Bower uses a vacuum system containing two different types of filters. It sits on the side of the lathe. He also uses a face mask for the dust and for those woods that may cause an allergic reaction. “Some people don’t realize that certain woods are highly toxic. It can be like turning a poison ivy branch. So breathing toxic wood is not good. Once I worked on some rosewood from either Indonesia or India. The next morning I woke up with a rash from head to toe,” he says. Now Bower checks woods online for their toxicity and has become quite knowledgeable about which woods are harmful. He also uses a book called Wood for Woodturners, by Mark Baker, which lists wood toxicity. Occasionally, he uses a face shield if he works on wood that’s potentially explosive. And to address shop noise, he has insulation in the ceiling and walls, and wears earplugs when using any loud equipment. 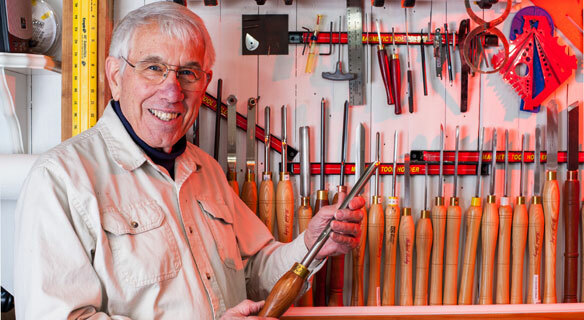 A good woodturner treasures the value of wood, so he uses the best tools–be it a tool to cut, measure, or monitor moisture levels–to create beautifully-crafted art. “Having the best tools makes all the difference in producing quality work. They are a pleasure to use and are well worth the extra money. They are easier to use and harder to abuse than cheaper, inferior tools. They’ll repay your investment in no time,” Bower says. Eric is excited to fight the moisture problems that cause billions of dollars of waste in the United States and the rest of the world. It also helps that he enjoys spending his free time woodworking, and he knows his projects will be free of moisture issues.